Olive Oil Can 2 L. Finca la Torre Ecologico Hojiblanca. You are, without doubt, before one of the best extra virgin organic oils that can be bought today in the market; thanks to the good work carried out by its producer "La Torre" for years. You can pay for your order by bank transfer, with Visa or MasterCard credit cards or by cash on delivery. Free shipping for all orders over € 70, for lower orders cost according to destination. We deliver your order within a maximum period of 48 hours during working days, throughout the national territory. You can return your order with all guarantees for 14 days from the receipt of your order. The property, located in the province of Malaga, has a privileged situation and a wide extension of olive trees and one of the oldest that can be found. It maintains such special characteristics that can be clearly marked in the distinction of all its oils. Specifically its hojiblanca variety is of the best value by expert tasters, as it presents an intense fruity to freshly cut grass and olive leaves. In the mouth it tends to be bitter, with a progressive and persistent spicy and you will notice a clear aftertaste of green almond, apple and light touches of banana peel. It is clearly an extra virgin complex and balanced that you have to try. Our most select recommendation invites you to taste it in your breakfasts, some breakfasts that will take you to the paradise of intense flavor. Also dare to taste it in a rich and simple salad of lettuce, salmon and walnuts, you will appreciate its flavor in its maximum expression. Note: All data is provided by the mill of origin. Olive Oil Can 2.5 L. Oro Bailén Picual. Olive Oil Can 2.5 L. Oro Bailén Arbequina. Olive Oil Can 2 L. Cladivm Hojiblanco. Olive Oil Can 2 L. Cladivm Picudo. 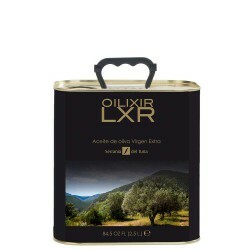 Olive Oil Can 5 L. Aldea de Don Gil Coupage. Olive Oil Can 5 L. Magnasur Picual. Olive Oil Can 2.5 L. Merula Coupage. Olive Oil Can 2.5 L. Olixir Coupage. Olive Oil Can 3 L. Deortegas Ecologic Picual. We use third party cookies to perform navigation analysis and improve our service. If you go on surfing, we will consider you accepting its use. Cincolivas is a family project that was gradually forged, until in 2009 it finally materialized as an Internet Portal. Project converted today into national and international reference portal, whose purpose is to make known the Extra Virgin Olive Oil and with it the best brands.